Two tornadoes touched down in two southern Ontario communities one year ago. Dave and Debra Andrukonis remember the event vividly and still feel the remnants of the storm. It's been a long and stressful year for Dave and Debra Andrukonis. When a tornado touched down in their south Windsor neighbourhood one year ago, the life-threatening winds damaged their property, their cars, and their spirit. "If Mother Nature decides to hit, she's going to hit you," said Debra. Watch the moment a funnel cloud forms over Windsor, Ont. The couple still enjoys watching summer storms roll through Windsor, but the twister that tore through their Riberdy Road neighbourhood a year ago Thursday was a frightening experience they relive through occasional nightmares. "You couldn't understand what was going on," said Dave of the ferocious winds that lashed the region, knocking out power to thousands of homes and felling trees. "Just pieces of debris, garbage cans, like a whole mix of mud and everything." On the night of the storm, Dave pulled his wife into the corner of his garage and laid on top of her to keep her safe. A sound he likens to a jet engine filled the garage as he was pummelled by flying debris and the shattered glass of broken windows. The twister caused considerable damage to more than a dozen Riberdy Road homes, but it was over almost as soon as it began. "I look around and I couldn't believe it," recalled Dave. "The sky was partially clear." The area was hit with two tornadoes a year ago, with the first tracking from the Detroit River to Islandview Marina shortly after 7 pm., whipping through parts of LaSalle for some two kilometres. Wind speeds reached an estimated 145 km/h. The tornado that tore through Riberdy Road touched down near Walker Road and tracked eight kilometres along E.C. Row and also damaged commercial buildings and the Transit Windsor depot. That twister had wind speeds of up to 210 km/h. Dave survived with bruises and scratches, but a large evergreen tree fell on Debra's car, just minutes after she arrived home. "If she was stuck in traffic for whatever reason, say a longer light, she would have been in the car at the time the tree landed on it," said Dave. The mature trees that graced the front lawn of the home where the couple has lived in for nearly 30 years are now just memories. Those that didn't fall that night were damaged and had to be removed. Neighbours have stopped by to offer condolences for the missing trees. Debra gets anxious whenever storms roll in now. "It's been hard," she said. "I get a lot of nightmares. I keep getting nightmares that I'm in the corner getting hit by debris." Dave endures fitful sleeps too, reliving that night and realizing what could have happened to his wife. "I think it was two months after. I was having nightmares realizing I may not be able to grab Debra," said Dave. "Anything else could have happened." But it's not just tornado flashbacks that have plagued the couple over the past year. Dealing with the insurance company has been a year-long problem. Dave has psoriasis and it flares up when he gets stressed. His elbows, arms, legs and face are covered in psoriasis spots. "This has been around since a month after the tornado. I don't know if it's from the insurance company or the tornado itself," Dave joked. He said he got his last cheque from the insurance company the day before the anniversary of the tornado. Dave said they sent in all the information to the company in February. Even after the tornado, dealing with insurance and fixing up their home, Dave said he realized it's not the cars or their home that's important, it's "the safety of my loved ones,"
There was criticism from both residents and politicians when Environment Canada issued its first tornado warning about 20 minutes after the first confirmed tornado had touched down in LaSalle. 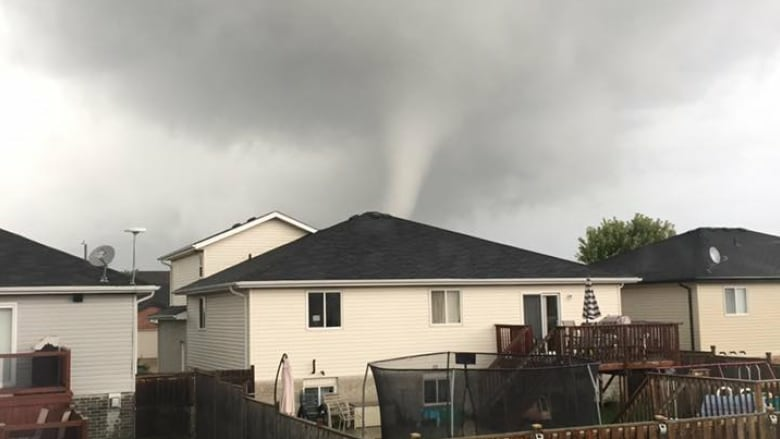 Environment Canada said a second tornado touched down in Windsor shortly after. "In the span of just 10 to 15 minutes this went from a relatively weak, average shower cell showing up on the radar to a very powerful thunderstorm," said Geoff Coulson, a meteorologist with Environment Canada. Since then, he said, Environment Canada has made several changes in the weather centre. It now has more access to the Detroit radar, which allows meteorologists to look for potential storms that could develop across the Great Lakes basin. It has also started using software to scan social media. "Now with the explosion of Twitter reports, Facebook reports, Instagram reports, we're better equipped to see those reports as they come in and get a better sense of which storms are producing severe weather," said Coulson. In the coming months, Environment Canada will be able to access a new American satellite that was recently launched. Coulson said it will be able to better detect storms across Windsor and the entire province. The national weather agency will "get a sense of what is affecting Ontario and try to get those warnings out with a fair amount of lead time," he explained.